What do you want out of your meditation practice? Pause for a minute and then write down all the reasons why you’re meditating. I can’t read your mind, but I can guess that at the very least you want to feel calmer and less anxious in your everyday life. But here’s a catch: by defining the reasons you’ve created the first major obstacle to effective meditation practice. “What is it?” you might wonder. It’s striving to achieve a measurable result. I’m not saying you shouldn’t want something out of your practice. But the desire to make meditation work the way you want can become a hindrance if not acknowledged early on. And I can totally relate. When I started my practice, I was disappointed after meditating regularly for a month and not seeing any significant result. Yes, I felt more comfortable during sitting meditation and started to notice some dysfunctional thought patterns in my mind, but that was it. I thought, “There must be something more to meditation than this. Why can’t I feel it? That was until I read Full Catastrophe Living by Jon Kabat-Zinn. In that book, he describes seven foundations of meditation which transformed my practice once and for all. Today I want to share my experience practicing them in this blog post. 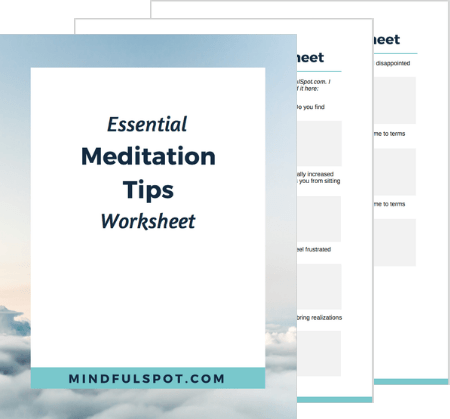 Almost all first-time meditators fall into the trap of evaluating their experience during meditation. For example, the moment you sit down and close your eyes you might notice a slight unease or discomfort. In this case a subtle “I don’t like this” thought may pop up in your head. When that happens, acknowledge the thought but don’t let it take you over. Use it as a perfect opportunity to stand as an impartial witness and let it be. As soon as you do that, you’ll notice that it’s just a thought, harmless and unobtrusive. Do this with every judging thought that comes to your mind. As you continue to sit and meditate, you may also feel rushed and find yourself wanting to finish as soon as possible. This means that you can’t accept the present moment as it unfolds in front of you. You think something more important is waiting for you in the future. As you encounter this tendency, remind yourself that this is your reality right now and nothing good can come from resisting it. Being patient with your mind is an essential aspect of any meditation practice. During your first couple of sessions, you might notice that it didn’t go the way you expected it go. Maybe you wanted relaxation but felt tension and unease. At that moment your mind might tell you that something went “wrong” and you didn’t do it the right way. When that happens, investigate that thought. How does it know that something went wrong? It implies that you did know how it’s supposed to go and what exactly you should have felt. That’s a false thought which fools itself into believing that it knows more than it actually does. It’s important to bring your beginner’s mind into meditation and not expect any particular result or feeling. Become comfortable with not knowing what true meditation feels like and let the moment-by-moment experience guide the way. Cultivating beginner’s mind is important but don’t take that advice too literally. It’s just a pointer, something to consider in your meditation practice. It’s just as important to trust your feelings and perceptions at any given moment. Don’t get caught up in authority of other people and blindly follow whatever they say or do. No one can tell you what you should feel or think. At some point, you’ll have to trust your intuition and if something doesn’t feel right to you don’t ignore it. Let me explain what I mean. You can find common meditation advice that it’s ok to feel discomfort during meditation and that you have to let it be and do nothing about it. But you don’t have to sit through the pain. It’s totally fine to readjust your meditation posture or even get up and take a short walk to relieve the tension. Did you know that meditation at its core is non-doing? You have reasons for practicing meditation and want to achieve a particular result. But when you do that you’re saying that you’re not ok now, that you don’t want to be the way you are right now. That may be the starting point, but the key is to realize that it’s also the finish line. The beginning is the end — they are one. They never were separate. The cultivation of mindfulness is paying attention to what is happening and allowing everything to be because it already is. This point comes naturally from the previous one. As you stop striving, it’s also important to accept the things as they are right now. Resistance creates only more resistance. Acceptance is the first step towards positive change in your life. Acknowledging where you are at this moment is a powerful realization that can give you the energy to move on with your life. But that doesn’t mean that you have to take a passive attitude towards life and resign yourself to whatever is. By accepting your current circumstances, you gain clarity and know what you need to do right here and now. Jon Kabat Zinn gives a beautiful illustration of letting go by describing how hunters trap monkeys in India. They drill a hole in a coconut, put a banana inside of it, and then secure it to the base of the tree. When a monkey puts a hand through to get the banana, it gets trapped because the hole is too small to let the fist go out. The same happens in your mind when you can’t let go of thought. As you may notice during meditation practice, your mind tends to hold on to certain thoughts and reject others. When you practice meditation, you should intentionally put aside the tendency to judge and give preferences. Practicing these seven attitudes will greatly enhance your meditation practice. To help, I put together this free worksheet that you can download it by clicking the button below.